If you head north from the Central West End Transit Center up Euclid Avenue from the Washington University Medical Center campus which includes Barnes-Jewish Hospital and St. Louis Children’s Hospital, you will soon realize a lot of new development going on. The corridor on Euclid Avenue between Forest Park Avenue and Washington Avenue has long been a center of activity in the Central West End neighborhood and is one of the densest areas in St. Louis, with residential towers, as well as unique architecture. More homes are being added each year, offering more residents and visitors a more pedestrian-friendly community as well as a car-option lifestyle. Construction is nearly complete on The Euclid, which is Koman Group’s $32 million project at 40 North Euclid, just a few blocks north of the Central West End Transit Center. The project includes 71 boutique luxury rental apartment units, along with commercial office space on the second floor and retail on the ground floor. The six-story building also includes underground parking. 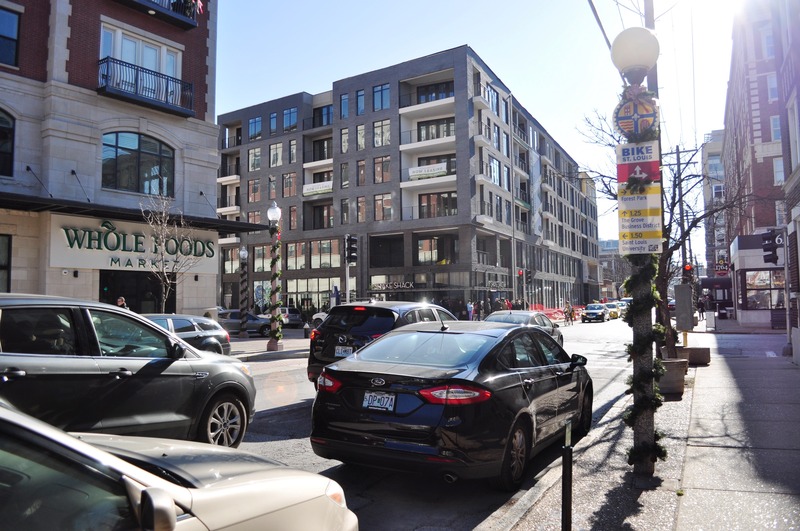 This project completes the buildout of West Pine and Euclid intersection, which includes two other existing apartment buildings, and The Orion, a seven-story mixed use building with 176 apartments and a Whole Foods on the ground floor that was completed in 2015. “The convenient access to modern and reliable light rail and the world class institutions it serves just blocks away, has driven the walkability and success of this neighborhood, and in turn, fueled our ability to confidently invest in this corridor,” said Garrick Hamilton, executive vice president at The Koman Group. “The convenient access to modern and reliable light rail and the world class institutions it serves just blocks away, has driven the walkability and success of this neighborhood, and in turn, fueled our ability to confidently invest in this corridor.” – Garrick Hamilton, Executive Vice President at The Koman Group. Although most of The Euclid apartment project will be open in 2018, the long-anticipated Shake Shack restaurant just opened its doors on December 11. Danny Meyer, founder and owner of the popular restaurant chain, is from St. Louis and chose the location, in large part, based on the unique walkability of the Central West End. In addition to Shake Shack, Kaldi’s Coffee and ZZA Pizza + Salad will occupy the ground floor. Finishing out the exciting additions to this transit-oriented corner on Euclid Avenue is 1764 Public House, a new restaurant by the Gamlin Brothers, who also operate The Whiskey House and Sub Zero Vodka Bar. The restaurant helps build an active corner on Euclid with its many windows, indoor and outdoor seating, and even a TV playing sports facing the sidewalk. The restaurant occupies the ground floor of the historic Forest Park Hotel, which was redeveloped into residences. To round out the development on West Pine, a 36-story apartment tower is planned at the corner of Kingshighway, and would be the city’s tallest residential building. The 316-residential unit building was designed by Studio Gang Architects as a modern, mainly glass building. The building could be under construction in early 2018 and completed by spring 2020, bringing even more residents within walking distance of the busiest MetroLink station on the Metro light rail system. Peter Cassel, director of community developments at Mac Property Management, notes the importance of location. Timeline: Construction to tentatively begin in 2018 with planned completion in spring 2020.